New Rockin’ Rapids Water Slide at Fun-Plex! Who is ready for SUMMER! Plans are happening now for an exciting Summer at Fun-Plex! New Attraction for 2018 at Fun-Plex! Rockin’ Rapids Water Slide will be the largest addition in park history! 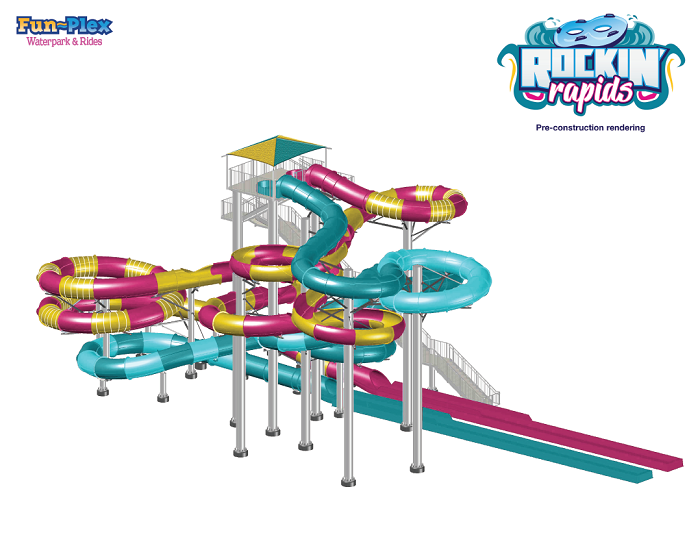 Over five stories tall, and with 1200 feet of sliding fun, Rockin’ Rapids will be one of the tallest and longest slides of its kind in the country. 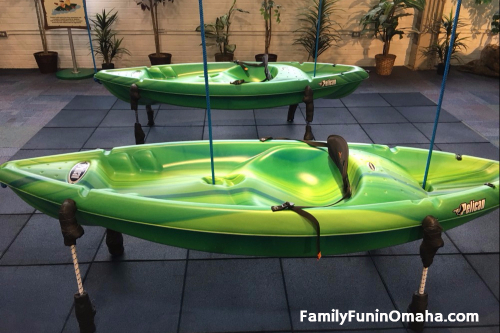 The brand new water attraction will feature two tube slides collectively moving 3,000 gallons of water per minute. Rockin’ Rapids is the biggest and most impressive addition to the park in 40 years! Plus, guests of Fun-Plex will now enjoy FREE tubes upon their visit this season! The addition of Rockin’ Rapids is a major milestone in a series of improvements to the park in the last few seasons. The Makana Splash AquaPlay Structure, Breaker’s Bay Swim-Up Bar, and Crazy Cars have all been successful additions to the park’s ambitious expansion efforts. Guests will love these latest new attractions, as well as the classics like the Fun-Plex Speedway Go-Kart track and the Lazzzy River! 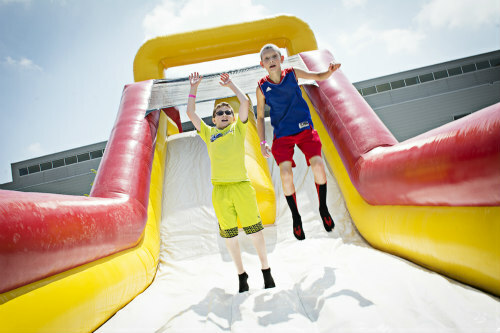 Visit Fun-Plex’s Facebook Page where they are sharing in the excitement and giving away passes! 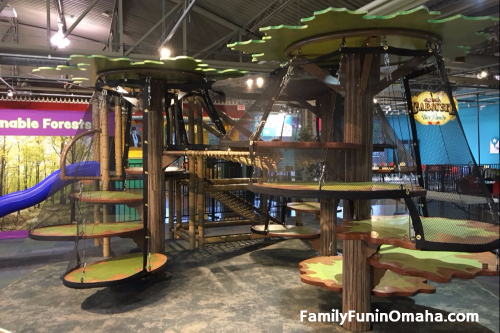 One Family Fun in Omaha reader will win a 4-Pack of Single Day Passes to Fun-Plex! Valid to use for one visit during the 2018 Season. This giveaway has ended. Many thanks to all who entered! Congratulations to Theresa W.! GIVEAWAY ENDS: Sunday, April 29. 2018, 11:59 p.m., CST. OTHER: Entrants must be 19 or older and located in the US only. The winners will be selected using random.org and notified via email. Winners must respond within 48 hours to claim their prize, or another winner will be chosen. Only one entry (+ bonus entries) per person. Duplicate entries will be deleted. 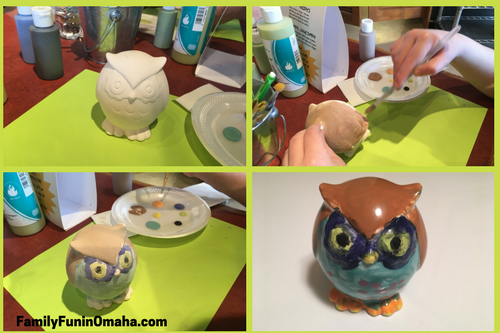 Creative Fun at It’s Yours Pottery! 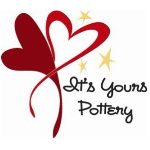 Come enjoy yourself at It’s Yours Pottery! We are excited to partner with them this year to help share all of the fun family-friendly events and activities they offer! 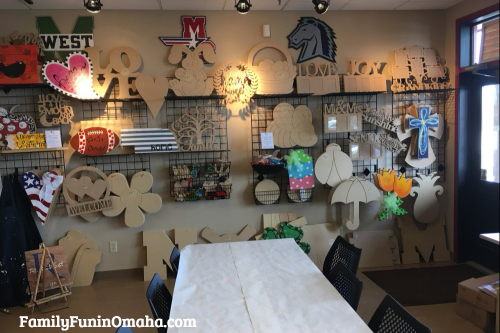 If you are looking for a family-friendly atmosphere to express a little creativity, this is the perfect place for you! 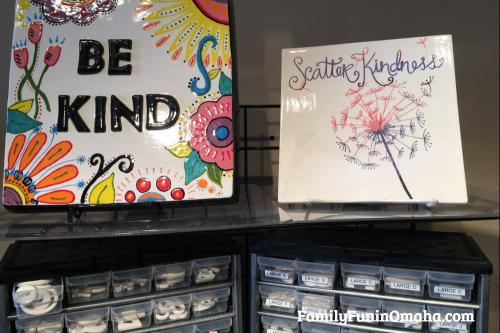 At It’s Yours Pottery, located at 132nd & Center, guests can enjoy Paint-Your-Own Pottery, hand-building with clay, glass fusion and canvas painting. 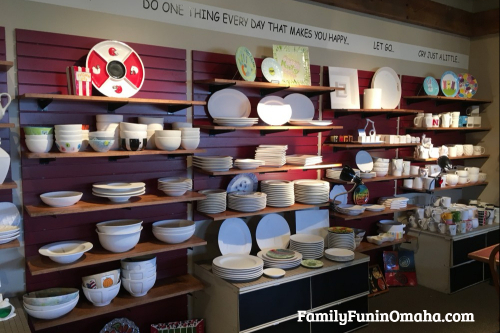 We first picked out our pottery, and had many choices including animals, decorations, housewares, frames, and perfect gifts! 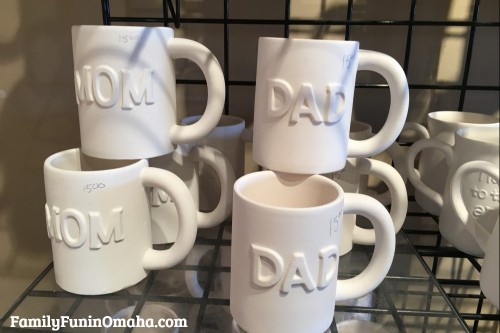 Perfect Gifts for Mother’s Day and Father’s Day! 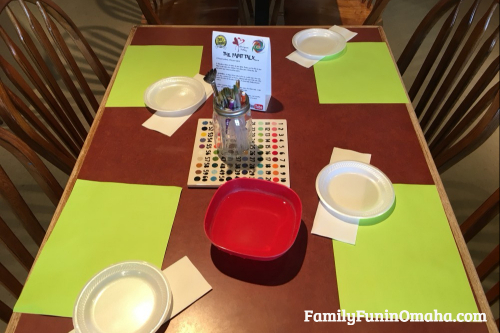 Paint-Your-Own Pottery at It’s Yours Pottery is a fun outing you can do together as a family! Be sure to take advantage of their Current Special Savings Days including Two-4-Tuesday and Family Sunday. Find out more here! 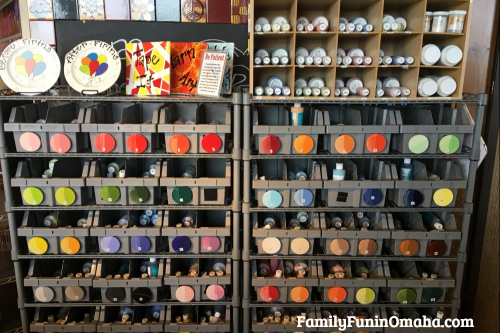 We loved choosing from all of the various paints they offered! 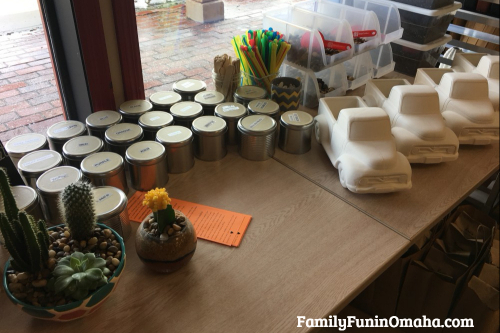 This included pastel colors, bright and bold, glittery colors, speckled paints, and various shades to get the perfect color we were looking for. 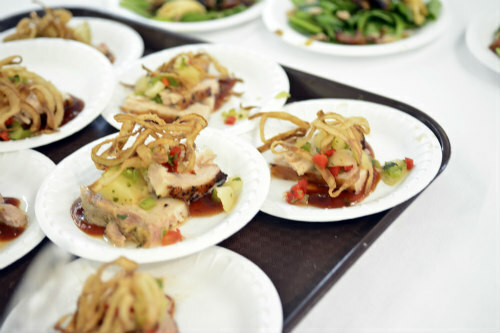 Each table was prepared with a variety of brush sizes and plates to create our own palettes. When it came time to paint – it was very relaxing! I loved watching my kids express their creativity with the colors they chose and the patience and attention to detail they showed while painting. 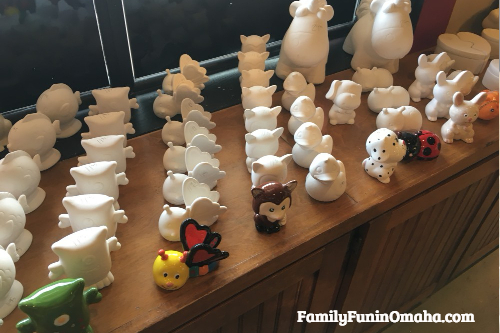 After painting our masterpieces, we left them there for about a week to be fired in the kiln. We were so excited to see our finished projects! I love the blue speckled background! All of our finished masterpieces! 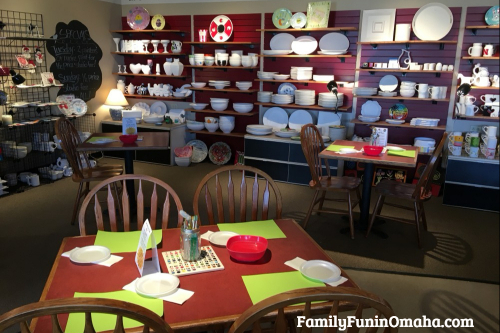 Celebrate your child’s special day with Birthday Parties at It’s Yours Pottery! Guests will be in a special section with a variety of fun projects to choose from. There was a birthday party going on while we were there, and they all looked like they were having a blast! 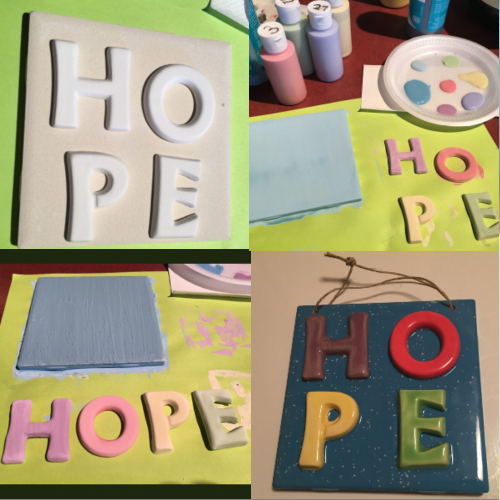 Fun Door Hangers and Wood Painting! Pottery Painting, Clay Hand-building, Glass fusion, Candle Making, Canvas Painting and multi media projects. Find out more here! 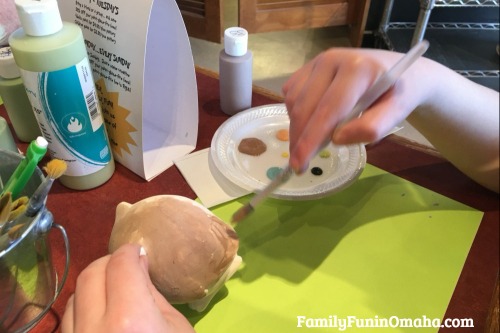 It’s Yours Pottery’s Kids Night Out offers 2.5 hours of fun for the kids and free time for parents! Kids will enjoy pizza, creativity (Different projects each session! ), games, and movie fun! Find out about upcoming events here and ENTER TO WIN 1 Kids Night Out Session below! 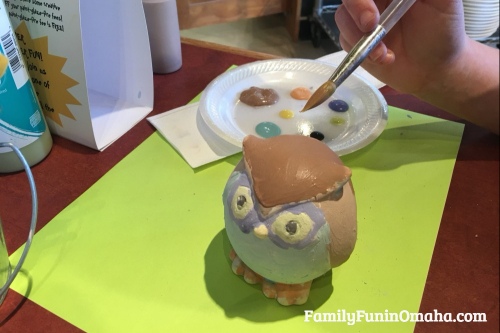 ​Spend a FUN family-friendly evening at It’s Yours Pottery, enjoying pizza followed with letting your inner artist out to play! Family Fun Night is the 2nd Friday of the month. Find out more here! 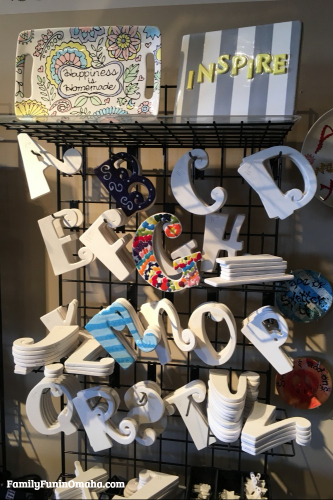 Gather your friends and make plans for an evening of pottery painting, glass fusion, canvas or wood decor painting, candle making or even create in our Cactus/Succulent Bar. Girls Night Out is the 4th Friday of the month. Find out more here! 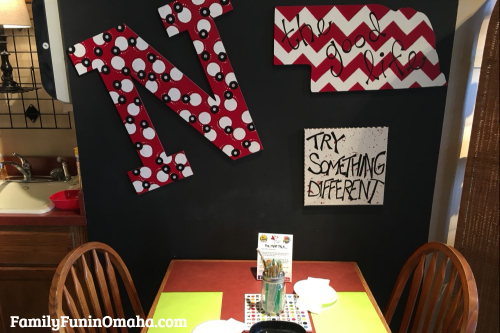 One Family Fun in Omaha reader will win a Gift Certificate good for 1 Kids Night Out (value $30). Can be used anytime through 12/31/18. 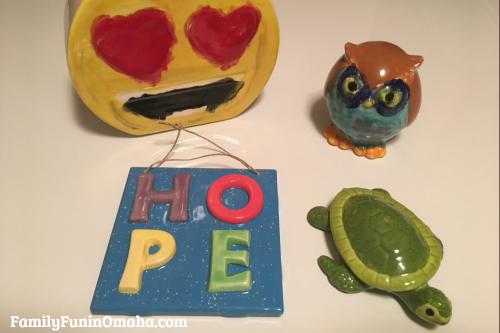 Winner will need to schedule Kids Out Night and redeem with It’s Yours Pottery. This giveaway has ended. Many thanks to all who entered! Congratulations to Elizabeth I! GIVEAWAY ENDS: Sunday, April 8, 2018, 11:59 p.m., CST. 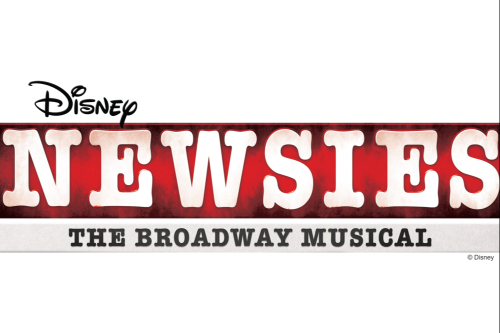 Newsies is coming to The Rose Theater June 2018! 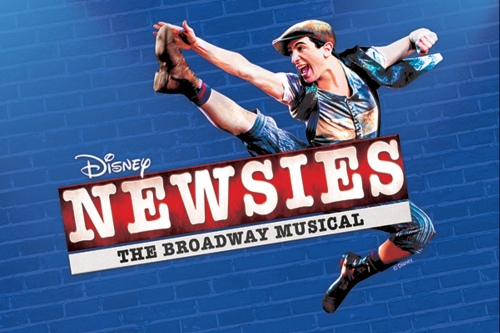 Newsies is coming to The Rose Theater Omaha this Summer! This upcoming premium show will be here June 1-17, 2018! Based on the real-life Newsboy Strike of 1899, this new Disney musical tells the story of Jack Kelly, a rebellious newsboy who dreams of a life as an artist away from the big city. After publishing giant Joseph Pulitzer raises newspaper prices at the newsboys’ expense, Jack and his fellow newsies take action. With help from the intrepid reporter Katherine Plumber, all of New York City soon recognizes the power of young people. Perfect for Kids – Q&A Session + Autographs! A few minutes after the performance, some of the actors will conduct a Question & Answer session from the stage. It’s a wonderful opportunity to learn more about the scenery, costumes, special effects, and other aspects of the production. Some performers will be available after the show to say hello, pose in pictures, and sign their autographs for you. You can meet them on the mezzanine level right outside the entrance to the balcony level seats. Tickets: Purchase your tickets here! This giveaway has ended. Many thanks to all who entered! Congratulations to Sheila H.! GIVEAWAY ENDS: Sunday, March 18, 2018, 11:59 p.m., CST. 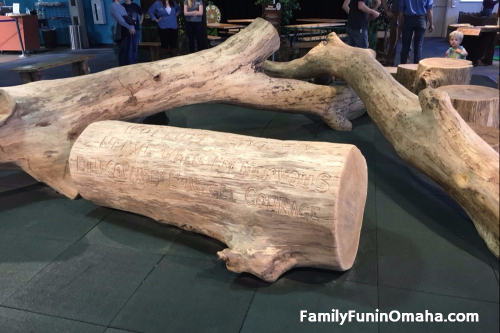 We were recently invited to visit the NEW Exhibit at the Omaha Children’s Museum, Forever Forest! 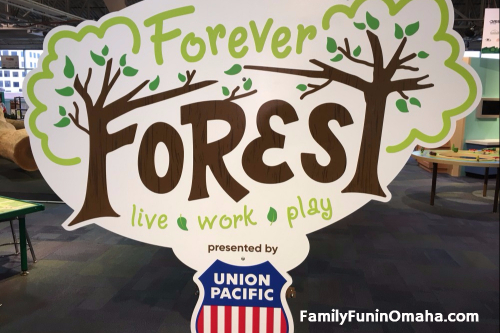 Forever Forest will be their first-ever exhibit designed to go on a national tour, but you can see it right here in Omaha first! Exploring the realities of forests through play, families will learn about sustainability, selective harvesting, transportation needs, and the every-day products we use that are made from trees. 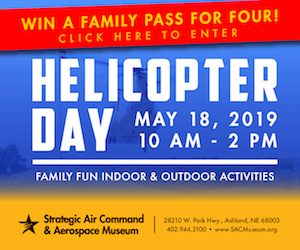 The exhibit includes a tree top climber, a realistic mini replica of a Union Pacific engine, a kid-sized home under construction for children to help build, and so much more! Nature Explorers – Calling all Nature Explorers! Come observe, explore, and investigate amazing aspects of the forest such as the beaks of birds, the fur of mammals, and different parts of a plant. Timber Trivia – It’s time for Timber Trivia! During this program, we will spin the great tree wheel to play bingo as we learn all about the surprising products that come from trees and the importance of trees in our everyday lives. The Great Forest Trek – Come join us, as we go on a trek around our Forever Forest. We will use our trail map and binoculars to search high and low for furry and feathery forest friends. Tree-rrific Treasures – We will use the treasures of the forest to help in our artistic endeavors. We may use a wooden drum and rhythm sticks to make beautiful music, act out a play set in the forest, or create any number of arts and crafts projects using materials from the forest. When: October 14, 2017 – April 15, 2018, and then begins its national tour. Cost: Included with regular Museum admission or membership. Current admission prices as of posting 10/17 are Kids 2-15 $12, Adults 16-59 $12, Seniors 60+ $11. 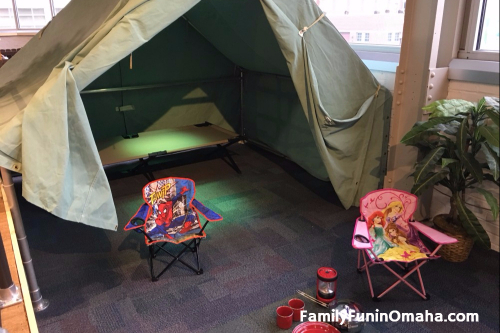 One Family Fun in Omaha reader will win a Family Pass which will admit up to 4 people for one day to the Omaha Children’s Museum. Pass expires 12/31/17. This giveaway has ended. Many thanks to all who entered! Congratulations to Carrie L.! GIVEAWAY ENDS: Sunday, October 22, 2017, 11:59 p.m., CST. Enjoy exciting exhibits, special events, and a fun Star Wars event this Winter! 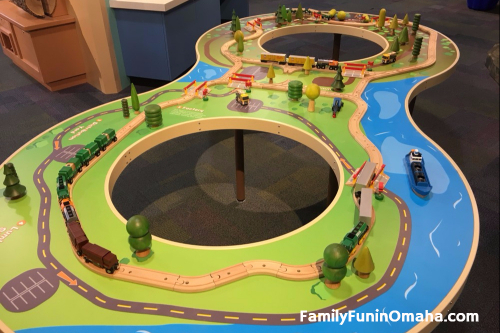 Play with the favorites from the past 40 years including popular items from Itty Bitty City, Once Upon a Farm, and Construction Zone: Return of the Bulldozer. 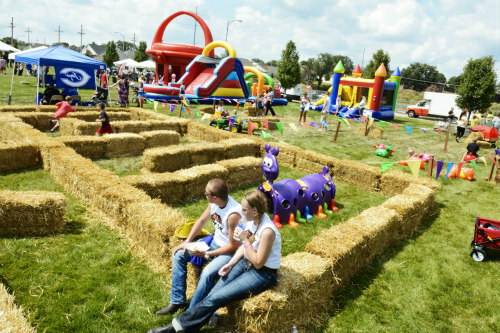 Enjoy fun activities including an Obstacle Course, Giant Operation Game, Combine, Mini Basketball Court & Soccer Field, Dentist Office, and more! Build, stack, and create cities in this new special exhibit including Read & Build Story Times! 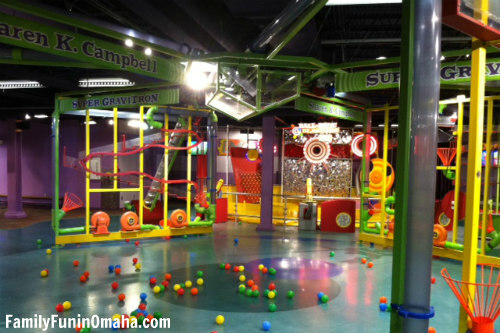 The Ball Room is one of our favorite places to play! Held on the First Friday of each month now through April, the museum stays open late for families to play! The theme for the next one on Friday, February 3, 5 – 8 p.m. is Candyland, where children can travel through a life-size Candyland game, and more! 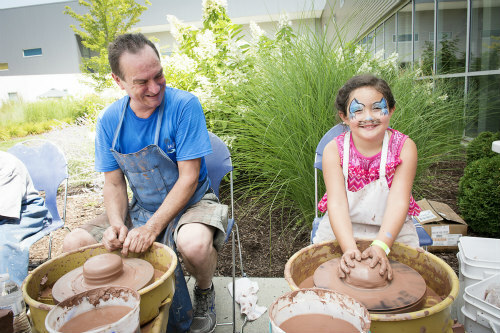 First Friday Family Date Night activities are included with regular museum admission or membership. A certified children’s yoga instructor will teach yoga to children, ages 6 weeks to 18 months, (and their special adult) in a fun, relaxed and positive atmosphere. 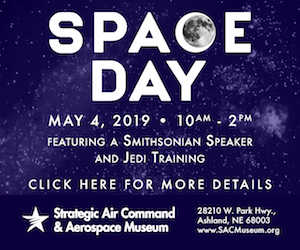 This class is FREE, but requires registration online as space is very limited. Museum admission is not included. Limited availability for each session. Ages 6 weeks – 18 months. One adult per child is required. Must bring personal yoga mats. Mats are not provided. Come learn baby sign language together every Thursday morning by a trained instructor. This class is recommended to adults who’ve already taken the museum’s Baby and Me Sign Language or another introductory class. Free to all Members and Non-Members. Museum admission is not included. Limited Availability for each session. One adult per child is required. Registration is for one session only. Multiple registrations for additional sessions is allowed. Participation in each session is recommended. Do you have a big Star Wars fan in your house? Get ready for Dinner on the Dark Side, a special Omaha Children’s Museum event, featuring Star Wars themed food and activities includes all-ages Jedi Training sessions, a 501st Legion costume exhibition, and interaction with costumed characters. Tickets are $35 for non-members, $30 for members. A limited number of tickets will go on sale. The ticket on-sale date will be announced soon. 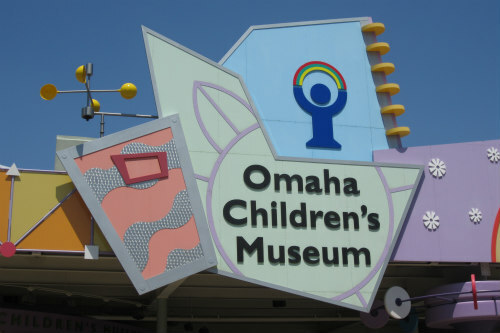 One Family Fun in Omaha reader will win a Family admission pass that admits up to four people for one visit to the Omaha Children’s Museum (Value $48). This giveaway has ended. Many thanks to all who entered! Congratulations to Sarah S.! GIVEAWAY ENDS: Sunday, January 22, 2017, 11:59 p.m., CST. 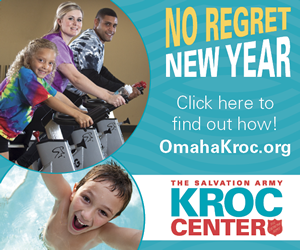 Many thanks to the Omaha Kroc Center for being an advertising partner and for providing the Family Pass for the giveaway! 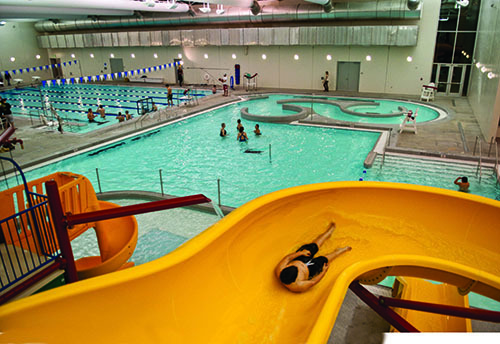 The Omaha Kroc Center provides a variety of fun classes, camps, exercise programs, gymnasium, family recreation pool, and more! 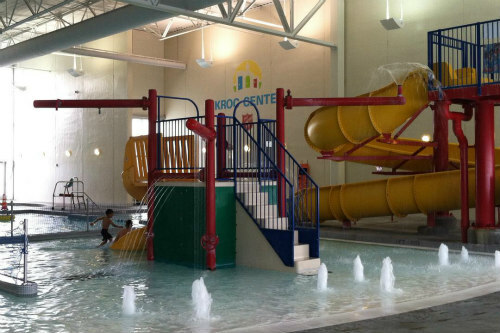 We love the pool at the Kroc Center, and are excited for the new renovations that will make it even better! Plus, enjoy special events including Inflatable Friday, Kids Kayak Racing, Sunday Funday in the Pool, and Family Splash Party! The tentative schedule for the pool renovation is the pool will be undergoing construction mid-January, closing the first week of February, and it will open back up again around April 1st. Access to the following during open scheduled hours: Aquatic Center including Lap Pool and Family Recreation Pool areas; Health & Fitness Center including cardio fitness and free weight area; Gymnasium basketball courts and indoor turf field; Game Room and common areas. Two Free Fitness Coaching/Evaluation Sessions. Discounted rates on most Kroc classes and youth day camps. Find out more about the January Membership Special here! This giveaway has ended. Many thanks to all who entered! Congratulations to Chareca B.! GIVEAWAY ENDS: Sunday, January 15, 2017, 11:59 p.m., CST. 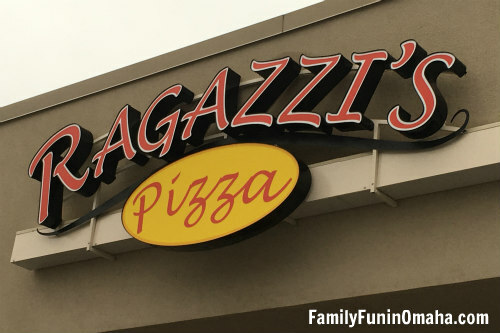 Many thanks to Ragazzi’s Pizza for inviting my family to visit the new Lakeside location for purposes of this review and for providing the giftcard for the giveaway! 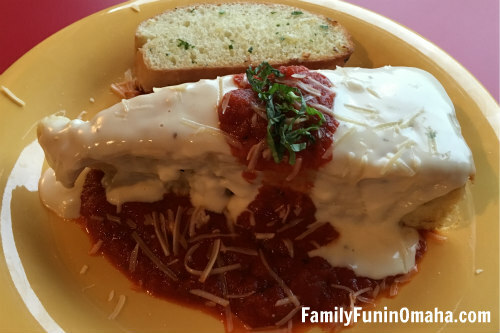 Looking for a family-friendly restaurant with delicious food? Love pizza and are eager to try something new? 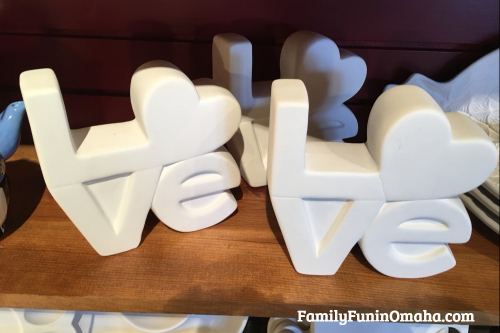 Planning a party and searching for a place to host it? Ragazzi’s Pizza offers all this and more and prides itself on a fast, casual dining experience. 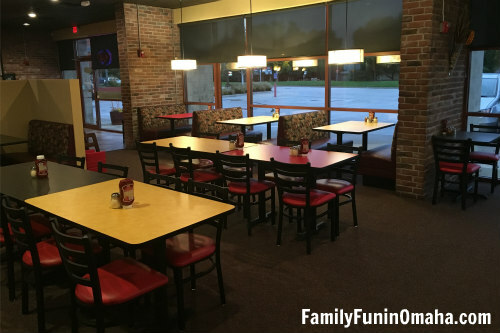 With 3 locations to choose from, families can enjoy delicious pizza, salads, pasta dishes, sandwiches, burgers, and a Kids Menu. It was so fun talking with Jeff, the owner, to better understand his goals in building Ragazzi’s Pizza. 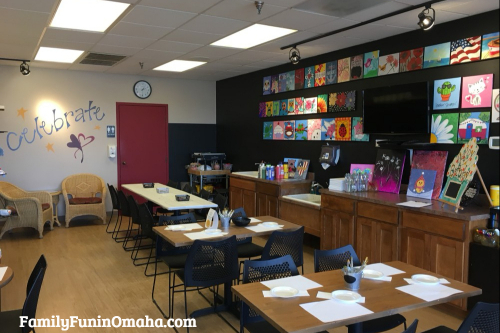 At the new location in Lakeside, he purposefully created a comfortable space where families can share a meal together without the distraction of TVs. He focuses on creating delicious meals, full of flavor, and excellent service. 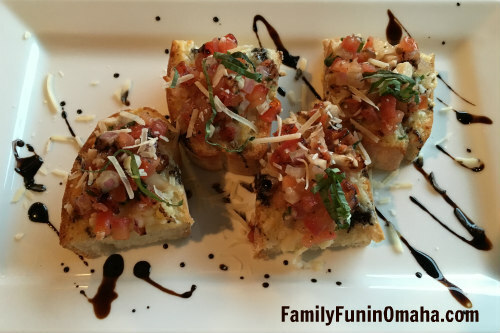 Their Bruschetta is wonderful, and is included in many other menu selections including Bruschetta Chicken Over Angel Hair Pasta, Bruschetta Chicken Sandwich, and a Chicken Bruschetta with Pesto Pizza! 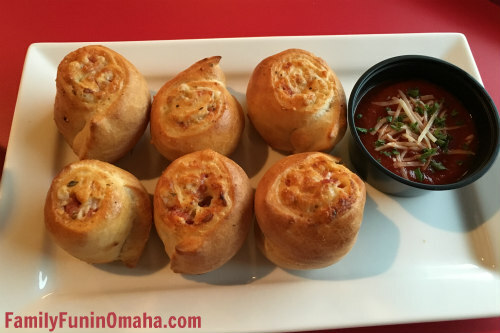 One of Ragazzi’s signature items are their Pepperoni Knots. I think my kids could have eaten an entire meal of these! Melt in your mouth with gooey cheese goodness made these a favorite. 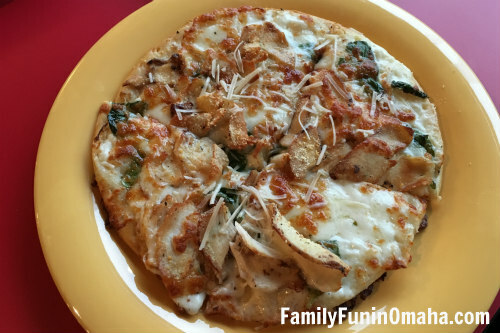 Our family loves pizza, and this was some of the best we have had! The flakiness of the crust is similar to a croissant, and the flavors blend well together. This Pizza Bianca with alfredo sauce, roasted chicken, artichoke hearts, and fresh spinach was amazing, and I love the thinly sliced chicken! 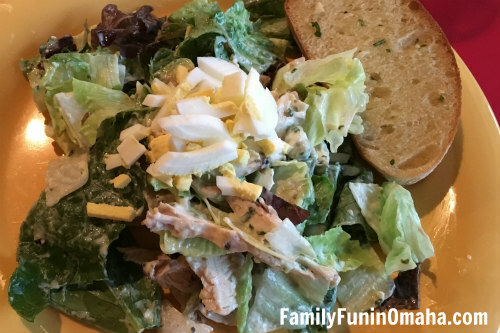 A friend recommended this Ragazzi’s Chopped Salad, and I am so glad she did! The avocados and creamy basil dressing make this an item I will definitely order again on a future visit. This Lil’ Slice of Heaven lives up to its name! Filled with baked angel hair pasta, alfredo sauce, and topped with smoked provolone, this unique pasta dish was very filling and flavorful. 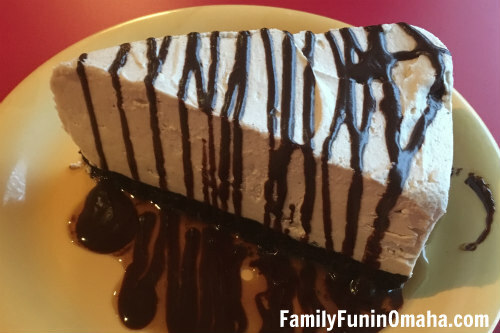 Top off your meal with the sweet Peanut Butter Pie, the perfect combination of Peanut Butter and Chocolate. This was voted a favorite by my kids. 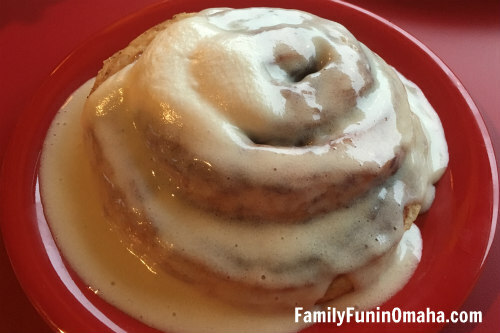 A Cinnamon Roll for dinner? Absolutely! So flaky and delicious, it was a perfect addition to our delicious meal. 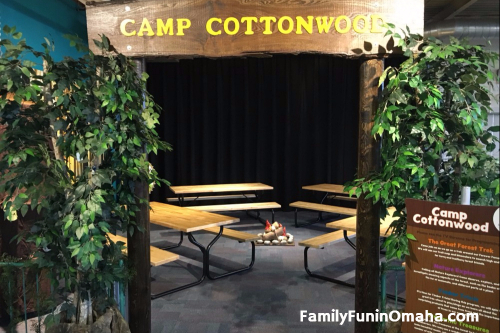 Family-Friendly Environment – FREE Party Rooms, too! Do you have a Birthday Party, Office Gathering, Holiday Party, or Baby Shower coming up? 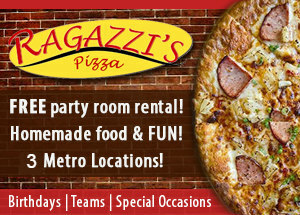 Ragazzi’s Pizza offers Free Party Rooms for up to 65 people in Ralston and 100 at Maple! Plus, they cater, too! Be sure to Follow Ragazzi’s Pizza on Facebook for fun giveaways, specials, and more! 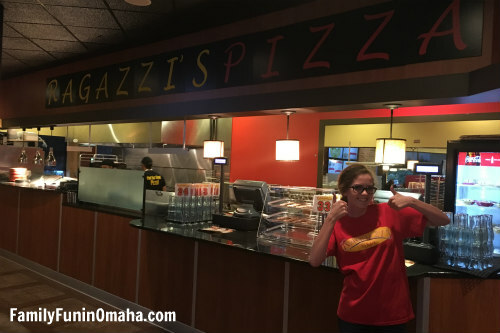 One Family Fun in Omaha reader will win a $25 giftcard to Ragazzi’s Pizza! This giveaway has ended. Many thanks to all who entered! Congratulations to Gina W.! GIVEAWAY ENDS: Sunday, October 23, 2016, 11:59 p.m., CST. The Rose Theater’s 2016-2017 Season continues with another wonderful production! I am very excited to see this show with my family, and watch this wonderful story come to life on stage! Everyone’s favorite ogre is back and bigger than ever in Shrek The Musical (TYA), the hilarious stage spectacle based on the Oscar-winning hit film by DreamWorks Animation. Shrek The Musical is recommended for families of children ages five and up. The show is approximately 70 minutes long without an intermission. Performances: Fridays at 7 p.m, and Saturdays at 2 p.m. and 5 p.m., and Sundays at 2 p.m. and 5 p.m. (Oct. 2 and 9 only). The 2 p.m. show on Saturday, Oct. 8 will be interpreted for people who are deaf or hard of hearing; the 5 p.m. show on Saturday, Oct. 8 is designated as sensory-friendly, with special accommodations made for families attending with a child on the autism spectrum. Tickets for Shrek The Musical are $20. Discount ticket vouchers are available at all area Hy-Vee stores. 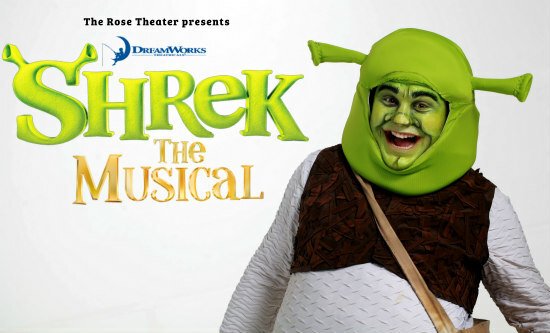 Members of The Rose receive four free tickets to the production, but the public is advised that Rose memberships are limited, and are close to selling out; The Rose does not expect memberships to be available for purchase beyond the production of Shrek The Musical. Call: The Rose Box Office at (402) 345-4849. One Family Fun in Omaha reader will win a 4-pack of tickets to a 5 p.m. show of Shrek The Musical (subject to availability). Shrek The Musical runs Sept. 30 through Oct. 16, 2016, with performances on Fridays at 7 p.m., and Saturdays at 2 p.m. and 5 p.m., and Sundays at 2 p.m. and 5 p.m. (Oct. 2 and 9 only). This giveaway has ended. Many thanks to all who entered! Congratulations to Monica S.! GIVEAWAY ENDS: Thursday, September 29, 2016, 11:59 p.m., CST. OTHER: Entrants must be 19 or older and located in the US only. The winners will be selected using random.org and notified via email. Winners must respond within 24 hours to claim their prize, or another winner will be chosen. Only one entry (+ bonus entries) per person. Duplicate entries will be deleted. 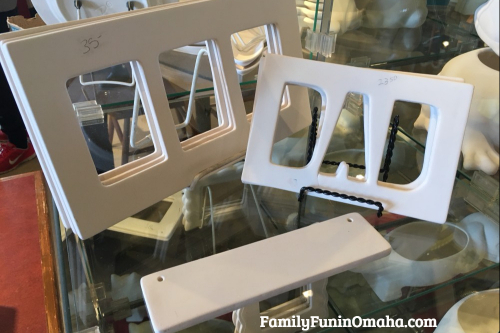 Many thanks to the Omaha Kroc Center for sponsoring this article and for providing the family pass for the giveaway! Love bacon and family-friendly fun? Enjoy both together in a FUN atmosphere at BaconFest Omaha, with all proceeds going to the Kroc Center Scholarship Program! UPDATE: Construction Sale right up until BaconFest on September 18th! Also the event is being moved completely inside the building! No need to worry about rain, heat, etc! Climate controlled Bacon!! 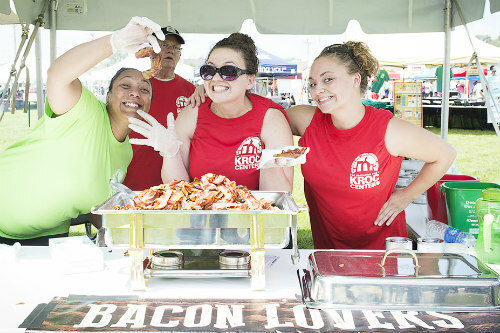 The Kroc Center is proud to present the 4th Annual BaconFest Omaha! Entertainment, Games and Lots and LOTS of Bacon! 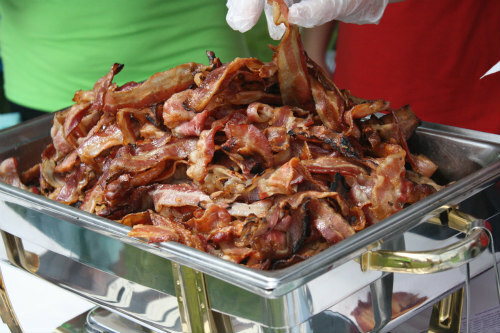 A celebration of bacon in all its tasty forms and a fundraiser for the Omaha Kroc Center! Date: Sunday, September 18, 2016 • 1 – 5 p.m. 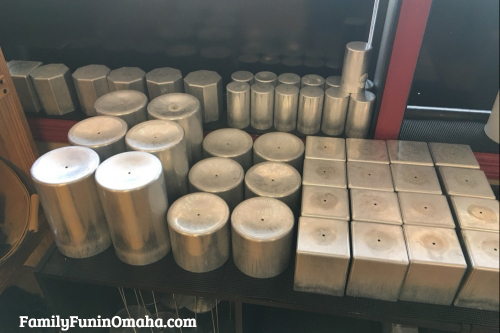 Giveaway: Win a Family Pass (two adults and two children) to BaconFest Omaha! 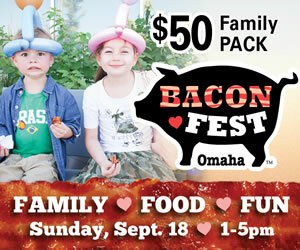 One Family Fun in Omaha reader will win a Family Pass (two adults and two children) to BaconFest Omaha on Sunday, Sept. 18, 2016, 1 – 5 p.m. at the Omaha Kroc Center. This giveaway has ended. Many thanks to all who entered! Congratulations to Lonna C.! GIVEAWAY ENDS: Sunday, August 28, 2016, 11:59 p.m., CST. Many thanks to Family Fare for sponsoring this post and for providing the prizes for the giveaway. 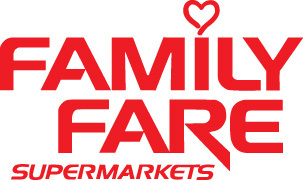 Enter to WIN $25 Giftcard to Family Fare Supermarkets below – 4 Winners! Eight newly remodeled Family Fare Supermarkets in the Omaha metro area are set to open on July 20, 2016, with Grand Re-Opening events! The stores were rebranded from No Frills and Bag ‘N Save supermarkets. Simultaneous ribbon-cutting ceremonies will take place at each location at 10 a.m.
Store guests are invited to attend the ribbon-cutting ceremony at their nearest Family Fare location, then shop the store and discover the new amenities and product offerings, which include the lowest everyday prices on fresh and organic produce, new lower prices on more than 4,000 store products and locally supplied meats from the heart of beef country. Grand re-opening events will include daily giveaways, food samples and surprise and delight offerings throughout the stores, with an emphasis on summer produce and local and living well products. Free insulated cooler bag to the first 100 customers beginning at 10:30 a.m.! 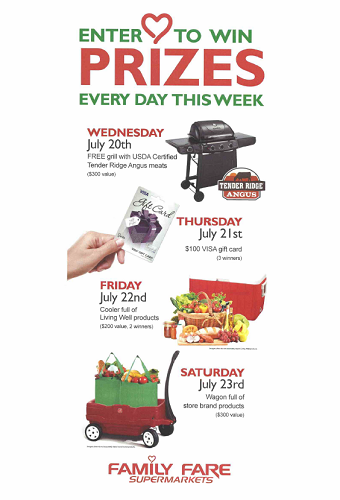 Store guests who shop with their yes Rewards Card between July 20 and the end of August will automatically be entered into the Super Sweepstakes. 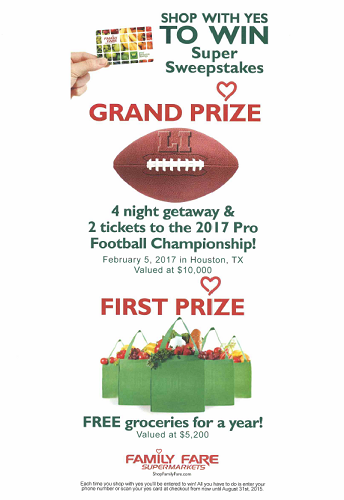 One lucky winner will win the grand prize- a four-night getaways and two tickets to the 2017 Pro Football Championship in Houston, Texas on February 5, 2017! Two first-prize winners will receive free groceries for a year. 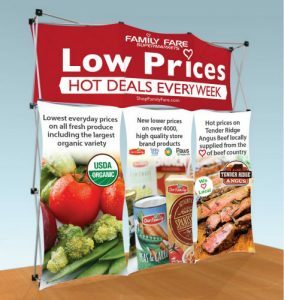 Giveaway: Win $25 Giftcard to Family Fare Supermarkets – 4 Winners! 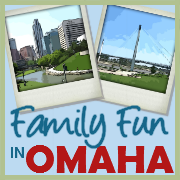 Four Family Fun in Omaha readers will each win a $25 Giftcard to Family Fare Supermarkets! This giveaway has ended. Many thanks to all who entered! Congratulations to Denise M., Ashley B., Nicole L., and Elizabeth T.! VISIT THESE LOCAL BLOGGERS FOR MORE CHANCES TO WIN!